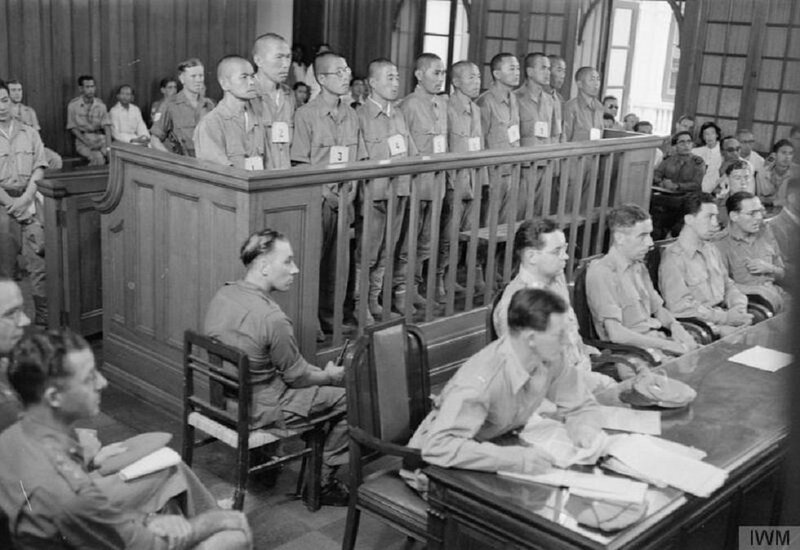 Indicted Japanese war criminals standing to attention in the dock of the Singapore Supreme Court at the beginning of the trial, 1946. Image taken by Royal Air Force official photographer Vasey (Pilot Officer), courtesy of Air Ministry Second World War Official Collection, Imperial War Museums. 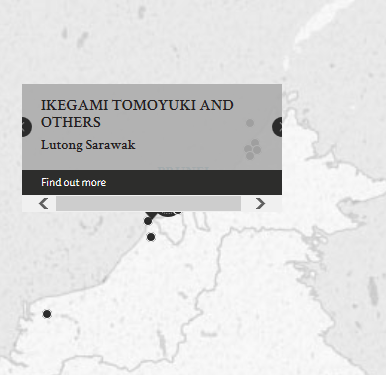 5 Indian POWs from a Japanese Romutai unit at Lutong, who had allegedly switched their allegiance to the Japanese during the war, were found attempting to escape the Japanese lines during their unit's withdrawal after Allied bombardment. They were found to have secret information and equipment on them, so the Japanese executed them on charges of desertion and espionage. Subsequently, another group of Indian POWs attempted to desert and take with them secret documents and rations. They were found out and executed on charges of espionage. On the first day of trial, the prosecutor had to apply for an adjournment because he had a surgical and dental appointment. This was allowed. There also arose a complex legal question of whether the Indian POW victims had voluntarily switched allegiance to the Japanese during the war and should be afforded protection as POWs under International Law or were henceforth subject to Japanese military law. Ikegami, Tomoyuki. Major. From Japanese army. From Japan. Guilty. Death by hanging. Sentence not confirmed. Takahashi, Yoishi. 1st Lieutenant. From Japanese army. From Japan. Guilty. 10 years' imprisonment. Sentence not confirmed. Takahashi, Tatsuo. 1st Lieutenant. From Japanese army. From Japan. Guilty. 10 years' imprisonment. Sentence not confirmed. Miyoshi, Ren. 2nd Lieutenant. From Japanese army. From Japan. Guilty. 10 years' imprisonment. Sentence not confirmed. Hisano, Jun. 2nd Lieutenant. From Japanese army. From Japan. Guilty. 10 years' imprisonment. Sentence not confirmed. Takahashi, Takeshi. Corporal. 2nd Lieutenant. From Japanese army. From Japan. Guilty. 5 years' imprisonment. Sentence not confirmed. Smith, S.J. Major. From British military. Solicitor. Supreme Court of England. Tatsuzaki, Ei. From Japanese military. Judge-Advocate. Ward, J.H. Lieutenant. From British military.